Introducing the Hawaiian Airlines Marketplace Mobile App! 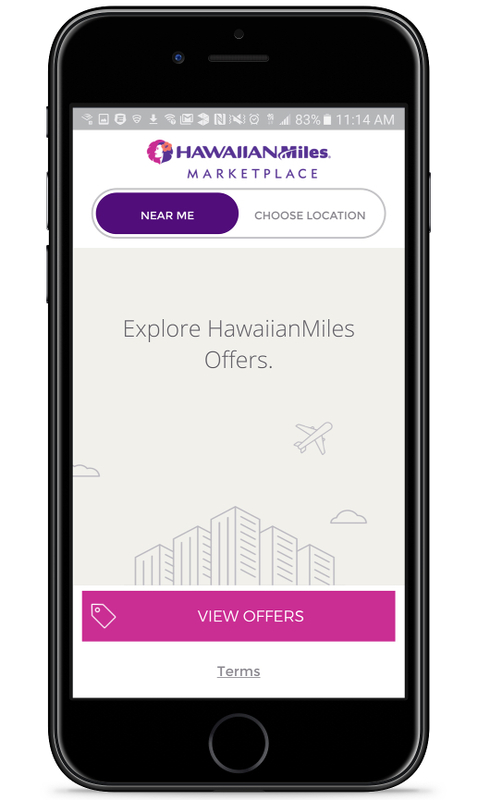 Introducing the HawaiianMiles Marketplace mobile app! Now you can find HawaiianMiles offers near you while you’re on-the-go. It’s easier than ever to find where you can earn bonus miles by using your Hawaiian Airlines® Mastercard® or Bankoh Hawaiian Airlines® Visa® Debit Card. Click install and you’re ready to go! Don’t miss out on earning even more miles! * Partner bonus miles earned through this offer are in addition to standard miles earned using your Hawaiian Airlines World Elite Mastercard, Hawaiian Airlines Business Mastercard or Bankoh Hawaiian Airlines Visa Debit Card. Partner bonus miles are not awarded on debit card PIN transactions. No miles are awarded on cash back transactions. Please allow 4-6 weeks for miles to post to your HawaiianMiles account. HawaiianMiles standard terms and conditions apply. Additional restrictions may apply, see partner for details. Barclays Bank Delaware and Bank of Hawaii are not affiliated with the merchants participating in the HawaiianMiles Marketplace. The Hawaiian Airlines Mastercard is issued by Barclays Bank Delaware (Barclays) pursuant to a license by Mastercard International Incorporated. Mastercard and World Elite Mastercard are registered trademarks, and the circles design is a trademark of Mastercard International Incorporated.